Over at Grantland, Zach Lowe wrote twoexcellent pieces about the way the Toronto Raptors’ stat analysts use SportVU data. Long story short: SportVU is a system of six cameras that films every action that takes place on a basketball court. The Raptors’ analysts take the SportVU coordinate data and generate a diagram of the ball and all ten players on the court. With input from Raptors’ assistant coaches, they have also created an algorithm that demonstrates ideal defensive positioning, and can compare this ideal to the actual positioning used by the players on the court. The piece actually includes three video examples of the diagramming at work, along with some more interesting tidbits — it’s definitely worth a read. As you know, I’m a tad skeptical – I believe advanced analytics have a place in a very human game, I’m just not sure how big that place should be – but the thing I worry about is it driving some kind of wedge between coaches, general managers and the analytics guys who truly believe their analyses are correct. …There is enough “creative tension” in many GM-coach relationships that an added level could be the one that causes and irrevocable split. …Any workplace – and I don’t care if it’s widgets or the NBA – works better when the leaders have the respect of those they are leading and if the personal relationships can make a group better than the sum of its parts. And no workplace – and I don’t care if it’s widgets or the NBA – works as well as it can if any key components are at cross purposes. In the process of product optimization, food engineers alter a litany of variables with the sole intent of finding the most perfect version (or versions) of a product. Ordinary consumers are paid to spend hours sitting in rooms where they touch, feel, sip, smell, swirl and taste whatever product is in question. Their opinions are dumped into a computer, and the data are sifted and sorted through a statistical method called conjoint analysis, which determines what features will be most attractive to consumers. CEOs and decision makers at food companies know that statistical analysis and the scientific method are the best ways to make informed decisions. This is because it works. Any company that doesn’t embrace these processes may experience short-term success, but in a competitive market they will always end up losing in the long term. Sports organisations — including professional teams — are no different. The ones that commit to evidence-based decision making will succeed in the long term. If an organisation that is trying to be evidence-based hires a coach who doesn’t “believe” or “trust” statistics, then clearly this organisation is not fully committed to evidence-based decision making. If you want your organisation to embrace statistics, don’t fill key positions with people who don’t share your philosophy. If you both use statistical analysis and employ coaches who don’t embrace stats, your approach is not only incoherent, it’s also contradictory. And finally, when you both use statistical anaylsis and employ coaches who are vocally opposed to the use of statistics, outsiders know that your commitment to evidence-based decision making is superficial. If, by trying to implement evidence-based decision making, an organisation creates an irrevocable split between it and its coach…too bad for the coach. The coach and the organisation are clearly not in agreement on an important issue, and so the coach should be let go. The sooner this disagreement is recognized by the organisation, the better. In this respect, Doug Smith is correct. Fourteen teams decided that sort of information is best kept to themselves. One team decided to pull back the curtain and let ESPN see Oz at work. …Three animations accompany the text. When told that on Tuesday afternoon, Raptors coach Dwane Casey reared back in surprise. Casey was left briefly speechless. It is difficult to credit that the people guarding the team vaults are also doing guided tours. Of course this idea is preposterous. What else would you do with a bunch of coordinate data, write a song? What the Raptors stats guys did with the coordinate data — as awesome as it is — is blatantly obvious and the first thing that comes to everyone’s mind when they hear about SportVU. The trick is to actually build a program that will turn the data into something usable. Likewise, demonstrating that they’ve created an algorithm to determine ideal defensive position is not going to give very much away, as they have not revealed how the algorithm actually works. To continue the food example, it would be like people saying Howard Moskowitz has ruined his livelihood by revealing that he uses conjoint analysis when he optimizes food products. Which is stupid. 12 Responses to "Does your team use fewer stats than Coca-Cola?" 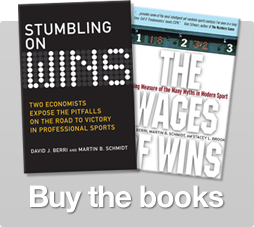 Both on the most recent Wages of Wins podcast. There was some discussion about the Raptors’ Rudy Gay trade, and a discussion of their willingness to sign mediocre players to large contracts (perhaps also a reference to Andrea Bargnani.) As Kevin and Dre (and many others) point out though, maybe the Raptors, in particular, could do a little more aiming before they fire. From my – admittedly naive – perspective, they’re likely to see better returns from improved talent evaluation and player utilization than from better defensive positioning. So, while it’s not the first thing that I thought of, the sensible thing to do first is probably to evaluate where likely, easy, and significant gains (in terms of money or wins) can be made using the data. In many ways, this probably boils down to “How have we been stupid?”, and people might not have the humility or confidence to handle that sort of information. Even if the Raptors do better by making other changes, the returns on the improvement from better defence might well be cost effective, and, considering whatever internal limitations there are, might have the best marginal return available for the effort. Given the discussion and articles that have taken place on WoW over the last few weeks regarding quants vs the conventional wisdom of experts/fans/management, the potential of SportsVu and ofcourse narrative. Should the not so subtle narrative that comes from the “we were one of the first to install SportsVu, 32% win percentage over 3 years, Andrea Bargnani/Rudy Gay/Demar Derozan led Toronto Raptors” not concern quants? I’ve always found the Raptors to be a great example of quantitative analysis working. They may have had good players but have chosen to pay and play bad players instead, and thats been reflected in their win-loss record, if not their salary vs wins ratios. It was a ‘I don’t need no stinking stats’ team that proved the quants position. Now it turns out they are actually the ‘I use stinking stats’ and still lose team? Its not hard to picture why someone who probably doesn’t have a statistical background and followed this team would be “a tad skeptical” of advanced statistics. You need incredible programmers who are integrated into your organization to get results like that. To simply replicate that program, it would take a top pair programmer team at least six months- maybe $300k initial investment, but they’d also need to know basketball and be great at working with video teams and assistant coaches (the player data isn’t the hard part- the ghost Raptors are just an amazing piece of programming). In terms of SportsVu cost v. Bargs/Derozan/Gay cost, they’re disparate issues. The scouting/stats department are trying to get the most out of the players they’ve got. It’s not their fault that the puzzle pieces to their system are actually moldy cookies. And moldy cookies aren’t going make any puzzle look good. Toronto is a major market without a legitimate star. If they can convert Rudy Gay into someone who everyone thinks is good (Kobe), from an NBA Basketball standpoint the trade will have been a success. Winning is secondary to having an entertaining product. My interpretation is that these guys might be pitching for the Next Job. They certainly have a killer app built and they are widely respected by guys in the know as knowledgeable guys. Given that, they are smart enough to be frustrated by what is certainly a broken decision making process regarding talent and strategy in toronto and recognize how unsustainable it is. They know a change is coming and are making sure that everyone is aware that it wasn’t their fault. Go read the section on shot selection and you’ll see how it bleeds through. The whole need for uniformity in the organization thing is completely bogus. I’ve worked for significantly broken organizations and been the voice in the wilderness crying for change. I’ve actually implemented that change and gotten good enough at it that it became my actual job to go in and fix organizations and teams. Go read up on Six Sigma, Total Productive Maintenance and the toyota production system. Results matter. The right data matters. A common sign when I walk into a broken plant is the preponderance of metrics that no one pays attention to be they good or bad. The raptors are generating reams of wonderful effective data but even without walking into their building I can tell that they are not using it to drive their decisions. Not a bad thought, James, but sports economists have shown that the most profitable (and we can therefore conclude most entertaining) teams are the ones who win lots of games and championships. Nothing makes a side more attractive than winning. Fascinating stuff! My first impression is that the brand of defense that the “ghost” players play is not only physically demanding, but also requires them to make a bunch of split-second calculations based on multiple variables. (If player A leaves his assignment, then split the difference between your man and his, unless your player shoots better than 27.5% from three, in which case…unless player B….unless…) It strikes me as the sort of decision making that computers excel at, but humans (especially humans that have been sprinting around for half an hour under hot lights in a really loud building) might have more trouble making (or at least making really quickly or consistently). It would be fascinating to see if a more aggressive, but more flawed defense is better than a less aggressive, but more regimented and graspable (and therefore more perfectly implemented) one. I wonder if the ghost players ever do things that seem strange or arbitrary (drifting toward the baseline on the weak side for no apparent reason)–like high level chess programs that are reacting to some probability in distant iterations of play. Yay. I could talk about this all day! you know, I’m kind of curious if they’ve cross-referenced the each ‘ghost’s ability with their physical abilities. I’m assuming that they do based on the fact that they have the data for the opponent (ie. how each opponent behaves on offense). Anyhow, this looks to be really neat and exciting! It’s not like you tell the team “here is our computer code, memorize it and report for scrimmage tomorrow”. You say, “you need to be more aggressive with your help defense”. A coach who is working with the analytics people should be able to determine whether or not the ghosts really represent what he wants his D doing, resolve any conflicts, and then be able to translate that into easily understood rules for his players. Also, you have a system for measuring almost literally every move your players make. How hard is it to write into their contract that all performance based incentives will be on how closely you mirror your ghost? At the end of the day, money talks. Dynamo.joe: Exactly. You take the simulation, find recurring patterns, and then turn them into a certain number of teachable principles. What you end up with then is not exactly the “same” as what the simulation is doing, although it’s quite probably better than what you were doing beforehand. A lot of this, I suppose, turns on how, exactly, the simulation comes to its conclusions. If it is executing an idealized version of what the designers and coaches believe to be “effective defense”, then there is a question about how they have come to those conclusions. However, if the simulation is basing its decisions on accumulated data and likely probabilities of future events (like a chess program), then you still might encounter problems with applicability (and, of course, I’m wildly speculating on all of this!). The last example in the second Lowe piece was what got me thinking about all this. In it, Ian Mahinmi leaves his man to contest an open John Lucas at the top of the key. According to the simulation, Lance Stephenson (who, at the time of the action, is on the weak side, fighting through a pick set by Amir Johnson) is supposed to “know” to abandon his man and box out Johnson. I bet he didn’t have a very good view of what was taking place at the top of the key or a particularly accurate picture of where the other players were on the court, and he had about a second to both recognize and make the decision. When I saw that, my first thought was “well, good luck getting me to do that in a pickup game”. I guess at least part of what I’m trying to get at is: if a defensive action taken by the ghosts (attack the pick and roll!) is based on presumed subsequent reactions by their ghost teammates (who have a sort of “perfect” knowledge) then you’re likely to see breakdowns caused by human limitation. The question is, if you know in advance that your teammates are going to blow their rotations, was that first move still the optimal one? Like Ryan and dynamo have said, humans have very different limitations. It seems that the next step involves developing that set of teachable principles and then test it via the ghosts over the many iterations of plays that they have at their disposal. While the player isn’t going to be able to compute the factors the way a computer will, they can and do act on of a short list of prioritized principles. So you define a list of triggers that the players can easily recognize and the range of actions they can understand to execute, and iterate and test these until you find that which is most effective, and then start the human trials. I’m sure that it would take a while to find the set that was optimally effective yet intuitive and comprehensible to humans. NBA players and coaches may not be receptive, but there’s always the D League guinea pigs. It might be illuminating to have the coach help to codify his own defensive principles for the system, and show him the actual results of that via the simulation as well, to illustrate why he may wish to consider a different option. This is incredible, clearly the future of basketball analytics. I mean the possibilities for this are endless! I’m salivating just thinking about it.